While you might not think of oats beyond steaming bowls of oatmeal or oatmeal raisin cookies, they actually have a number of uses in the kitchen. Oat groats -- another name for intact, hulled oat grains -- make a healthful addition to your diet. Like other whole grains, they help fight Type 2 diabetes and cardiovascular disease. Use oat groats in your cooking to reap the health benefits of their fiber and mineral content. Each serving of oat groats -- a 1/4 cup raw, or approximately 1 cup cooked -- contains 152 calories and provides 8 percent of the daily calorie intake in a 2,000-calorie diet. The groats provide 6 grams of protein per serving, which helps maintain healthy tissue and a strong immune system. A serving of groats also contains 26 grams of carbohydrates, including 4.1 grams of dietary fiber. These carbs fuel your active lifestyle and provide energy needed for brain function, while their fiber content helps lower your chance of developing cardiovascular disease. The fiber in one serving of oat groats contributes 11 percent toward the daily recommended fiber intake for men and 16 percent for women, according to the Institute of Medicine. 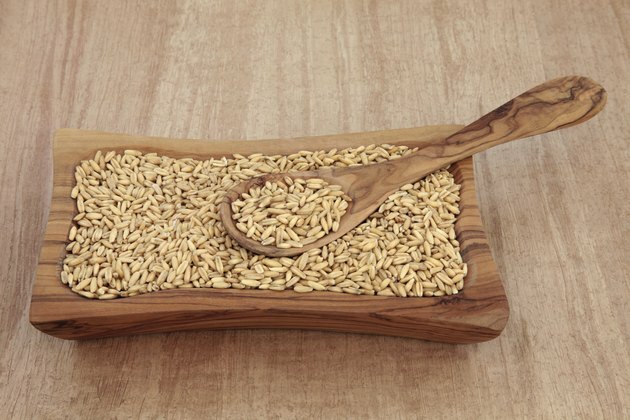 Oat groats contribute beneficial minerals -- including iron and phosphorus -- to your diet. Both iron and phosphorus make up components of compounds essential to good health. Phosphorus is incorporated into your DNA, bone mineral tissue and ATP -- a source of energy -- while iron is incorporated into hemoglobin and myoglobin, two proteins you need to transport and store oxygen. Each serving of oat groats contains 204 milligrams of phosphorus, or 29 percent of your recommended daily intake, according to the Institute of Medicine. The groats also provide you with 1.8 milligrams of iron per serving -- 10 and 23 percent of the recommended daily intakes for women and men, respectively. Oat groats also offer antioxidant benefits due to their zinc and copper content. Both minerals protect your tissues from free radicals, which would otherwise damage your DNA, contributing to genetic mutations and disease. Zinc also plays a role in immune function, while copper supports nervous system health. Each serving of oat groats offers 244 micrograms of copper -- 27 percent of the recommended daily intake, according to the Institute of Medicine -- as well as 20 and 15 percent of the recommended daily zinc intakes for women and men, respectively. Oat groats take much longer to cook than rolled or steel-cut oats -- up to an hour -- so they're best suited to leisurely breakfasts rather than a quick meal before you jump into your daily grind. Try them topped with fresh berries, sliced banana and pecans. Alternatively, use oat groats in grain salads. Combine the groats with dried cranberries, chopped dried figs and an orange-and-mint dressing, or mix them with toasted walnuts, chopped kale, slices of roasted carrots and parsnips and a maple-and-mustard vinaigrette. You can also chop the groats in your food processor or blender for homemade steel-cut oats.